The genetics of skin cancer is an extremely broad topic. There are more than 100 types of tumors that are clinically apparent on the skin; many of these are known to have familial components, either in isolation or as part of a syndrome with other features. This is, in part, because the skin itself is a complex organ made up of multiple cell types. Furthermore, many of these cell types can undergo malignant transformation at various points in their differentiation, leading to tumors with distinct histology and dramatically different biological behaviors, such as squamous cell carcinoma (SCC) and basal cell cancer (BCC). These have been called nonmelanoma skin cancers or keratinocytic cancers. The outer layer or epidermis is made primarily of keratinocytes but has several other minor cell populations. The bottom layer is formed of basal keratinocytes abutting the basement membrane. The basement membrane is formed from products of keratinocytes and dermal fibroblasts, such as collagen and laminin, and is an important anatomical and functional structure. As the basal keratinocytes divide and differentiate, they lose contact with the basement membrane and form the spinous cell layer, the granular cell layer, and the keratinized outer layer or stratum corneum. Some debate remains about the origin of SCC; however, these cancers are likely derived from epidermal stem cells associated with the hair follicle. A variety of tissues, such as lung and uterine cervix, can give rise to SCC, and this cancer has somewhat differing behavior depending on its source. Even in cancer derived from the skin, SCC from different anatomic locations can have moderately differing aggressiveness; for example, SCC from glabrous (smooth, hairless) skin has a lower metastatic rate than SCC arising from the vermillion border of the lip or from scars. Additionally, in the epidermal compartment, melanocytes distribute singly along the basement membrane and can transform into melanoma. Melanocytes are derived from neural crest cells and migrate to the epidermal compartment near the eighth week of gestational age. Langerhans cells, or dendritic cells, are a third cell type in the epidermis and have a primary function of antigen presentation. These cells reside in the skin for an extended time and respond to different stimuli, such as ultraviolet radiation or topical steroids, which cause them to migrate out of the skin. The dermis is largely composed of an extracellular matrix. Prominent cell types in this compartment are fibroblasts, endothelial cells, and transient immune system cells. When transformed, fibroblasts form fibrosarcomas and endothelial cells form angiosarcomas, Kaposi sarcoma, and other vascular tumors. There are a number of immune cell types that move in and out of the skin to blood vessels and lymphatics; these include mast cells, lymphocytes, mononuclear cells, histiocytes, and granulocytes. These cells can increase in number in inflammatory diseases and can form tumors within the skin. For example, urticaria pigmentosa is a condition that arises from mast cells and is occasionally associated with mast cell leukemia; cutaneous T-cell lymphoma is often confined to the skin throughout its course. Overall, 10% of leukemias and lymphomas have prominent expression in the skin. 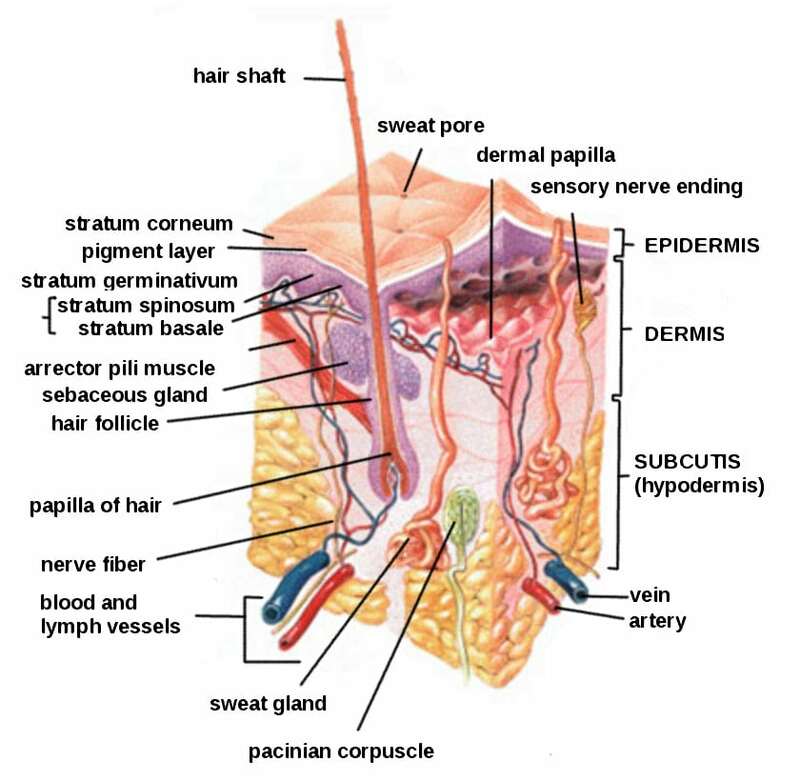 Epidermal appendages are also found in the dermal compartment. 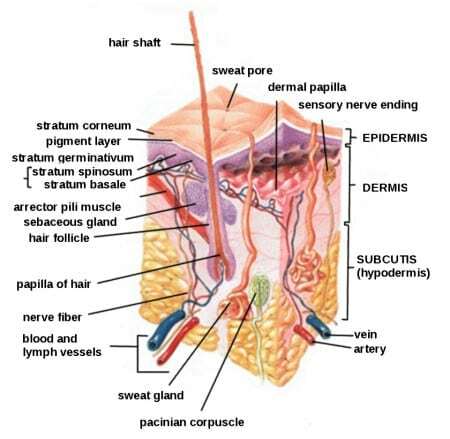 These are derivatives of the epidermal keratinocytes, such as hair follicles, sweat glands, and the sebaceous glands associated with the hair follicles. These structures are generally formed in the first and second trimesters of fetal development. These can form a large variety of benign or malignant tumors with diverse biological behaviors. Several of these tumors are associated with familial syndromes. Overall, there are dozens of different histological subtypes of these tumors associated with individual components of the adnexal structures. Finally, the subcutis is a layer that extends below the dermis with varying depth, depending on the anatomic location. This deeper boundary can include muscle, fascia, bone, or cartilage. The subcutis can be affected by inflammatory conditions such as panniculitis and malignancies such as liposarcoma. These compartments give rise to their own malignancies but are also the region of immediate adjacent spread of localized skin cancers from other compartments. The boundaries of each skin compartment are used to define the staging of skin cancers. For example, an in situ melanoma is confined to the epidermis. Once the cancer crosses the basement membrane into the dermis, it is invasive. Internal malignancies also commonly metastasize to the skin. The dermis and subcutis are the most common locations, but the epidermis can also be involved in conditions such as Pagetoid breast cancer. Clinical Presentation of Skin Cancer What are the Risk Factors of Skin Cancer?